Peppery arugula balances tart apples in this stunner of a salad. 1. Over medium heat, stir mustard seeds in dry skillet until lightly toasted. About 3 mins. 2. Transfer to bowl, allow to cool. 3. Add vinegar, mustard, shallots; whisk to blend. 4. Gradually whisk in oil. 1. Peel, slice celery root very thin. 2. Bring thick pot of oil to 300°F on stove top. 3. Drop celery root slices into pot of oil, fry until crisp. 4. Season with coarse salt, while chips are still warm. 1. Julianne celery root. Set aside. 2. Trim and thinly slice radishes. Set aside. 3. Toss arugula in large bowl with enough dressing to coat lightly. 4. Divide watercress evenly among individual plates. 5. Combine celery root, radishes, apples in same bowl; toss with remaining dressing to coat. 6. Season to taste with salt, pepper. 7. Top arugula with celery root mixture. 8. Layer celery root chips throughout salad. 9. 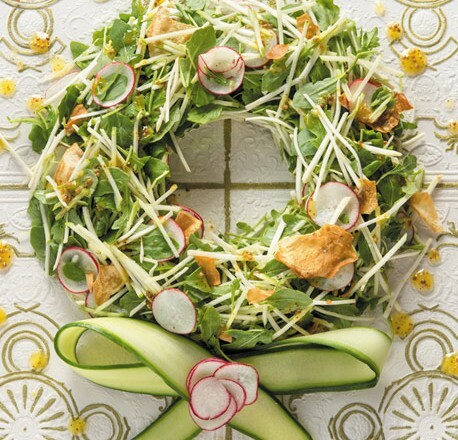 To garnish, make a wall with thinly slices apples along the salad.